At the risk of stating the obvious, we'd like to briefly discuss the importance of making an ad’s objective and call to action (CTA) go together. Like peas and carrots. 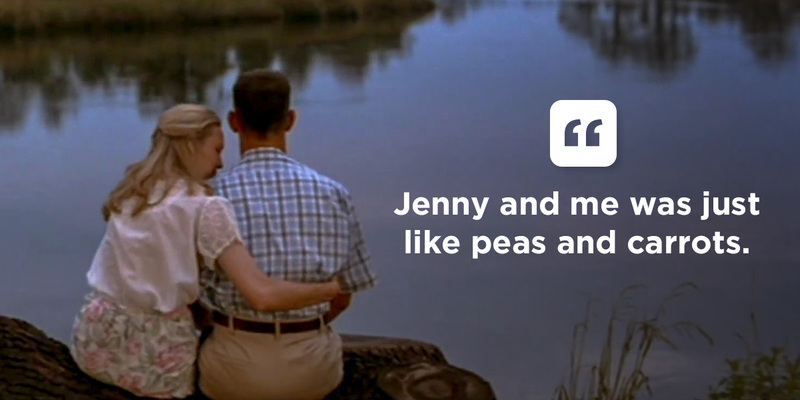 Like Jenny and Forrest. Since it’s a pretty simple subject, we’ll Gump it: run through it quickly, then that’ll be all we have to say about that. what should the CTA be? Like the cafe’s Facebook page? Nope. Sign up for a newsletter? Of course not. Why shouldn’t we use those CTAs? Because the objective is to sell lunches, so the CTA needs to get people through the door, not onto Facebook or into an app. Again, we're sorry if this seems completely obvious. We don't mean to insult your intelligence and certainly don’t think you're stupid or something (yes, that's a Gump reference). But the fact is that even smart companies sometimes get their ads and objectives mixed up. We saw an example just last week. We won’t name or shame the business, but have created this example ad that contains the same mixup. 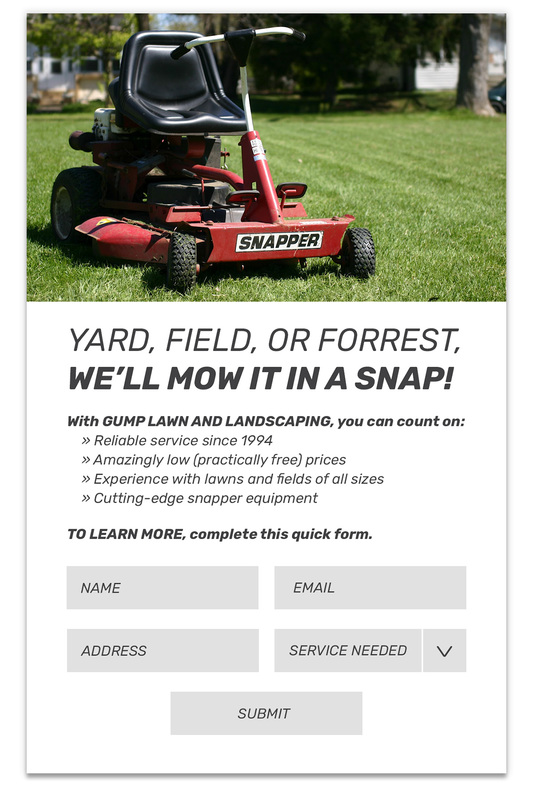 The objective is apparently to generate awareness about Gump Lawn and Landscaping. The ad introduces the business, presumably for the first time to an audience who doesn’t know them. The appropriate CTA for this type of awareness ad is to “learn more” by going to a web page, video, or article that provides additional info. Put simply, an awareness ad shares information; it doesn’t collect it. Yet what does this ad ask us to do? Instead of telling us more about Gump, it asks us to tell Gump about ourselves. Wrong timing. We’ve just been introduced. We’re not going to hand over our contact info to strangers and get stuck on their email list forever. Wrong audience. Short forms work great, but only with qualified leads, that is, people who are already familiar and in the market for what’s being advertised. Wrong use of a lead form. We should never require someone to fill out a form in order to get basic information about our business. That info should be free and easy to access. Wrong incentive. Actually, there’s no incentive here. A short form should always offer something in exchange for a person’s contact information—a gift, discount, or benefit that rewards a person for submitting their info. To be clear, there’s nothing wrong with either type of ad that we’ve discussed—those to generate awareness or sales leads. But there is a problem with mixing them, because unlike peas and carrots, they don’t go together. Despite our intention to be brief, this article ran a little longer than expected. We’ll bring it home by saying this: pairing the right objective and CTA it doesn’t take a lot of brainpower, but it does take a little thinking. We only covered two of the many possible objectives you might want to accomplish, and the issue is further complicated by your choice of ad placements and media types. You just need to be sure you're thinking through these choices up front. Again, getting them right doesn't require being an exceptionally smart businessman or woman, but it can help to have a smart business partner. If you need one, we make a great Lieutenant Dan. You’ll have to find your own Jenny.